My mother took leave of cousin Elizabeth, Zacharias and newborn John. It had been a wonderful visit but she felt it was time to leave now that John had been born. She wanted to get back to her life in Nazareth and Joseph. “It seems not unlikely that, during the course of this prolonged journey by foot or donkey back to Nazareth , Mary’s thoughts would wander to Messianic scripture passages ‑ searchingly, expectantly. Granted, we can not know the exact nature of Mary’s thoughts and reflections in these circumstances, but we know she loved the scriptures and knew them well. They were alive for her! She was living out age‑old prophecies. That is, she was physically, maternally linked to the One in her womb fulfilling all prophecy! To guide our reflections let’s consider some of the Messianic texts from the Prophet Isaiah which were widely known throughout Israel. Isaiah, under the influence of the Spirit of God, focuses on a “child” (a son) who is the Messiah and more, he is Immanuel (God with us), Mighty God and Prince of Peace. And in some real way, this “little child shall lead” us. Not by mere coincidence has the Church come to love these prophetic passages with a tender passion. The Church sees the incarnational mystery revealed here in beauty, hope and peace. Now if Isaiah was attracted by this “child”, Mary was completely mesmerized. A shiver probably ran up her spine whenever she recalled the words: “…the virgin shall be with child, and bear a son, and name him Immanuel”. 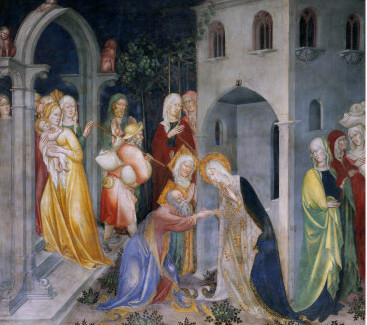 For Mary was the virgin chosen by God to fulfill this prophecy and her unborn baby was the promised One. But all Christians should share in that same prophetic shiver of anticipation at hearing “to us a child is born” and “to us a son is given”. To us Unborn Jesus was sent as a sign of hope ‑ and for every vulnerable unborn child: He is their only Hope.